Whether they are into t-rexes, fossils or the Land Before Time, most kids go through a dinosaur phase. 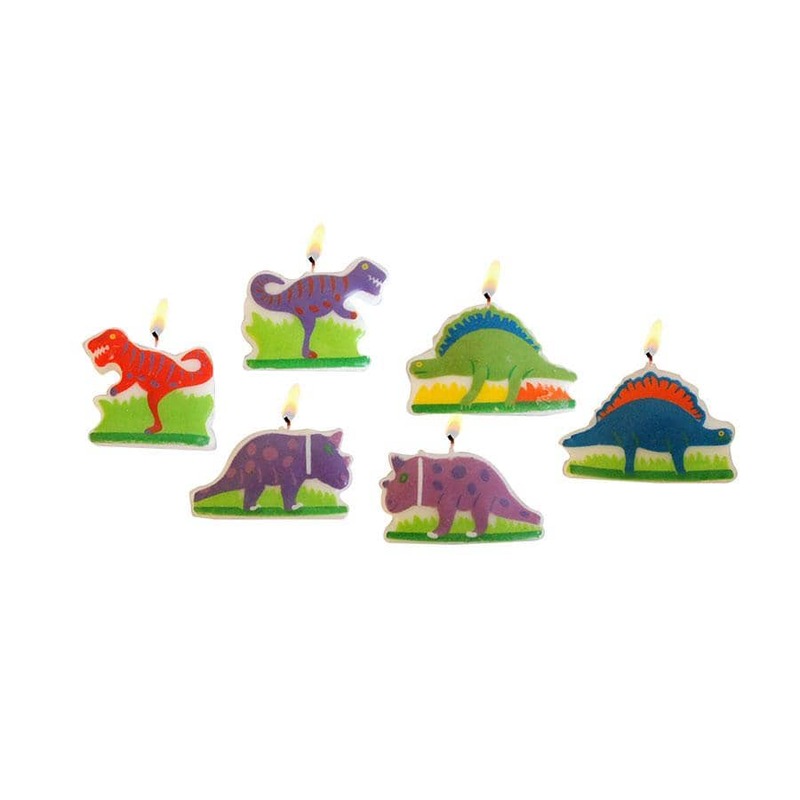 With these exciting crafts and action packed activities, your child and their friends can have a great time romping, stomping, and roaring at a dinosaur themed birthday party. Dinosaurs are known for their massive tails. In this game, your kid will see just how cumbersome they could be. To get started, you will need to mark off a path about 25 feet long and 6 feet wide. This will become an obstacle course full of objects that can easily be tipped over. For example you can arrange a bunch of empty water bottles with green paper wrapped around them as a “forest”. Or a “mountain” made out of shoeboxes standing on their side. One thing to be careful of is that the obstacle course can be set up quickly – at least a couple of objects will need to be stood back up almost every time someone goes through. The other thing you will need is a pool noodle that you can turn into a “dinosaur tail” by attaching the end of it to a child-sized belt so the end of it drags along the ground. Divide the kids into two teams, both of which should pick dinosaur names for their groups. Then, they can take turns going through the obstacle course with the dinosaur tail strapped onto them. The catch is that they are not allowed to knock anything over, or touch their tail with their hands. Whenever a player gets through the course, that team gets 5 points. However, for each object a team member knocks over with their tail, they lose a point. To make the game more exciting, add a time limit, like 45 seconds. If the person does not finish the course in this time, they lose points for whatever they knocked over, and do not get any points for completing the course. After everyone has gone through three times, tally up the scores and see which team is the winner. This activity is a little like capture the flag, except with some prehistoric differences. Divide an open area, like a park, into two sides. On each side, the teams should craft four “volcanoes” by piling salt dough (there are plenty of easy online recipes), dirt, clay, sand, or another similar substance around an opened but full, small bottle of Diet Coke – just make sure the mouth of the bottle sticks out. Next, each team will get a “dinosaur egg” (you can use something like a soccer ball, or actually make a dinosaur egg out of paper mache beforehand) they should put in the furthest corner of their area. Mark off an area of about 10×10 feet around each of the volcanoes and the egg; this will be a safe zone where people cannot be tagged. Then give each team a few packets of Mentos candy – just make sure they don’t eat it all. The objective of the game is for someone to steal the egg from the opposing team, and bring it back to his or her own side. However, whenever the other team tags someone in their territory, that person is out. There are two ways to get back into the game after being tagged; if someone steals the opponent’s egg, the game restarts and everyone is back in from both sides. The other way to get back in is for a teammate to erupt one of the opposing team’s volcanoes without getting tagged. This can be done by dropping a piece of Mentos candy into the soda bottle to make it foam up and erupt. Whenever this happens the captured people from the team that set off the volcano are back in the game. One thing for the kids to keep in mind is that each volcano can only be erupted one time, so they should split them up between games. Each time a team wins, they earn 15 points. Each time they lose, they lose 5 points. The game ends after three rounds. Many dinosaurs had voracious appetites and amazing strength. This game is great because it combines both, and all you need to set it up is a rope and some “pterodactyl” chicken wings. The Extinction Tug of War takes place near over one of the volcanoes from Capture the Egg. The two teams stand on either side of volcano with a rope between them and then pull against each other. If someone gets pulled over the volcano, they have fallen into hot lava are extinct until they can gobble down one of the pterodactyl wings. As soon as they do this, they are back in. Kids will love pulling and sliding each other around and over the volcano, and then racing off to chow on wings as soon as they are out. The game ends when every member of the team has become extinct, whether it is because they were overpowered, or just could not eat fast enough. They can play for three rounds, where they’ll receive 15 points for winning and a 5 point penalty for losing. After treading carefully through the obstacle course, running around stealing eggs and exploding volcanoes, and a battle of brute force, the kids should be tired from a long day of dinosaur activities. The winning team can get the first slices of the birthday cake – after the birthday boy or girl of course. Then the children can change into their kids footed pajamas and settle down with a movie like Ice Age or the Land Before time.